And it doesn’t even require a large amount of hair. Just a fews grams (ca. 5-8 grams) —or about a handful of hair—are needed to produce a diamond. The hair can originate from one or several people, or even a pet. To guarantee that we produce a diamond with the hair you’ve provided us with, the hair will be registered and tagged right from the beginning, and subsequently sealed. This way we make sure that only the hair you provide is used for your diamond. 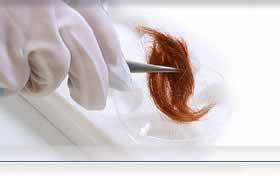 Before the hair is converted into a diamond, it is analyzed to filter out its various components. A certificate is then drawn up confirming that your diamond is comprised of the sample of hair you provided. After the formalities are taken care of, the hair provided is then burned in a special oven at low temperatures. The heat and chlorine in this oven create a vacuum that converts the carbon into graphite. The graphite is then placed into a so-called diamond press. During the HPHT procedure, the carbon is transformed into a raw diamond at pressures of about 60,000 bars and temperatures of around 1,600 °C. At this point, the production stage is basically completed. Next, you choose how you want your diamond cut. This makes diamonds of hair a very unique gift with an unmatchable sentimental value!